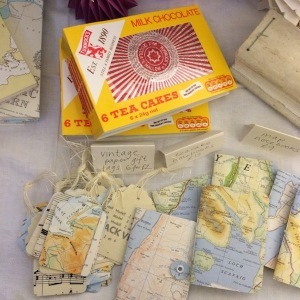 On the Isle of Mull Producers markets take place throughout the summer season, and occasionally in the winter too. 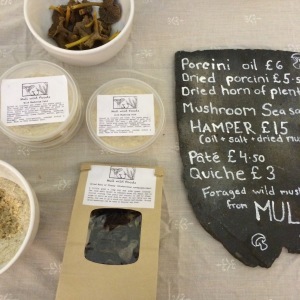 Yesterday afternoon, Dervaig Hall held its annual Christmas Producers Market. As there had been quite a few posts on Facebook recently, from producers advertising their wares, we knew it was going to be a good one. The hall was packed with tables and the produces varied from beautiful hand made baskets (from the Ross of Mull) to wild gathered dried mushrooms to silver jewellery to intricate paper Christmas decorations. And so much more. The hall committee were doing the teas, and the foyer tables were filled with folk enjoying tea, cake and a catch up. Jo lives near Calgary and makes beautiful things in paper. You can see her work at Calgary tea room during the season – books and lovely pictures. Today she was selling delicate decorations and a great selection of books she had made. I couldn’t resist buying one of the ones covered in a map. The map was part of the county of Angus, where I grew up, but just missing where I lived by a whisker! 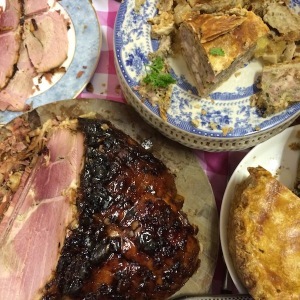 Louise, married to N who does the maintenance for the cottages in the winter, is a chef and she has teamed up with Fiona who farms near Dervaig to supply Christmas hams and beautiful looking crusty pies. They cleverly offered samples and took orders for delivery nearer Christmas. To me, it sums up the great thing about local produce – a link and partnership has been made between producer and chef, and combined they are offering something pretty special. Fiona supplies much of the local pork that is on offer from our local shop. Garth from Sgriob ruadh was also there with the Isle of Mull cheese and his delicious bacon, sausages and hams. He makes an assortment of flavoured sausages. They have a smoker, one that the Tobermory Fish factory were not using any more, so he can smoke his hams in oak from Killiechronan – land which they also farm. Garth helps us a lot with neighbourly farming things and I was happy to buy some of his delicious produce. 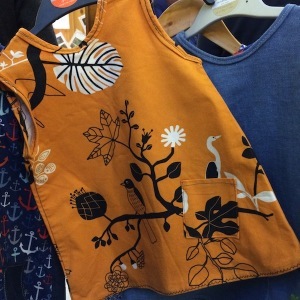 Mary and her partner Jamie started up Mull Electric Bikes along the road at Calgary, but at the Mull Producers Market today she was selling beautiful dresses that she has made from recycled materials. They made me wish I had a toddler again! 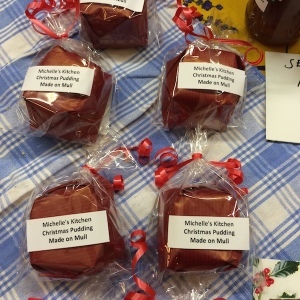 There were so many producers selling lovely things, it is not possible to write about them all, but I cannot not mention Michelle – she is another local chef, from Penmore near Dervaig, and she makes the marmalade we give to our cottage guests. By the time I arrived at the market she only had these dainty Christmas puddings left – all her Christmas cakes and mince pies had been sold already. The wild mushrooms made me a little nervous, not because I worry that they might poison me, but because I worry about sustainability and picking for more than your own pot. So I asked whether it was sustainable or not to gather from the wild. I was assured by Connor who lives in Tobermory, that they only harvest where they have the landowner permission to do so and that they are careful not to over-harvest. He explained that the mushroom is the fruit and that where they harvest you can go back and see the new mushrooms coming. Both he and his partner are conservation biologists (I think that is what he said). 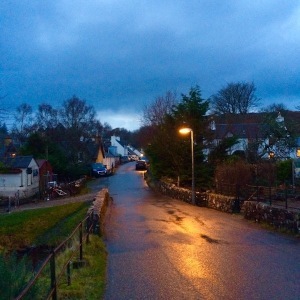 When finally I came away from the market, the street lights were on and Dervaig was settling down for the long evening ahead.